Operation of the shaker can be timed or continuous, while the speed is variable. Both time and speed are set digitally. Setting parameters is easy with the analog knob. Values are shown on the large, three digit display. 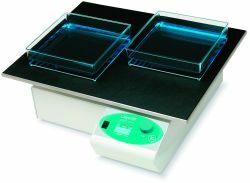 Three platforms are available to accommodate a variety of different sizes of containers and vials on the Orbit 1900 Shaker. The flat platform is useful for shaking trays, plates, boxes and other containers. A nonslip mat on the platform surface keeps items in place. Flasks are accommodated on the flask platform through the use of clamps (sold separately). 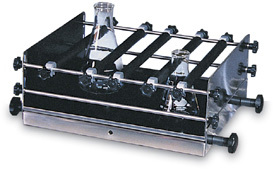 Universal platform can be used with various size flasks, bottles and odd shaped vessels. Custom manufactured platforms/clamps are available. 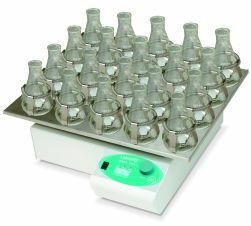 Suitable for use in an incubator or cold room, the Orbit 1900 Shaker fits easily inside .